Use auto coding to organize dataset content into case nodes or theme nodes for further exploration. A dataset contains structured data arranged in records (rows) and fields (columns). Datasets can contain classifying columns and codable columns. You can use the Auto Code Assistant to code content of codable columns. In List View or Detail View, click on the dataset you want to auto code. On the Analyze tab, in the Coding group, click Auto Code. Follow the steps on the Auto Code Assistant. For datasets containing survey data, auto coding may have already taken place during import with the Survey Import Wizard. The Wizard creates, classifies and codes to cases for each respondent and creates and codes to nodes for each question. For example, if you have imported survey results from a spreadsheet, you can auto code to gather all the responses for each question. The image below shows a dataset containing survey responses to two questions. 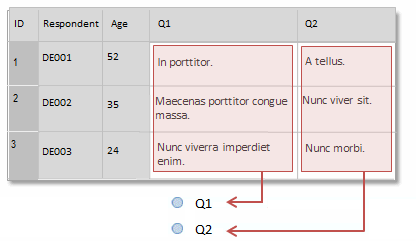 With auto coding, you can create a node (Q1 and Q2) for each question. The responses to each question are automatically coded at the relevant node. For example, if your dataset contains survey results, you can auto code to gather everything a particular respondent has said. In the image below, a case is created for each respondent (DE001, DE002, and DE003) and the responses are coded at the relevant case. If you have collected demographic information about the survey respondents, you could auto code based on the values in other classifying columns—for example Gender or Age. You can also group the responses together to create and code at a node for each demographic group—for example Age 21-30, Age 31-40 and so on.